Monsignor, can you please give us an overall view of Miag-ao Church? Monsignor: At the outset, church is not just about the structure. The Church is actually about the people of God. Miag-ao church is over 200 years old. It celebrated its bicentennial in the year 1997. One of the baroque churches in the Philippines, yes, but Miag-ao Church is not a fortress church. It is a misconception to call Miag-ao Church as a fortress church although it may look like one. Why is that so Monsignor? 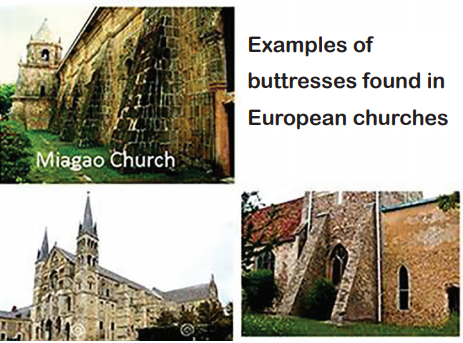 Monsignor: The impression may have arisen because of the huge buttresses of the Church. If you take a look at it, the Church has 7 stone buttresses on each side. These serve as “Contra Puertes” of the church meaning, these massive buttresses were constructed and designed to reinforce and withstand earthquakes and typhoons, but not for any military purpose. So, it is wrong to claim that Miag-ao church is a fortress church. Is there any other church that stands like Miag-ao church? Monsignor: Yes the one in Patnongon, Antique as far as the relief in the façade is concerned. The façade of the Patnongon Church also shows St. Christopher carrying the child Jesus just like in Miagao. Monsignor, what is the unique feature of an Augustinian-built church? Monsignor: Augustinian-built churches have a prominentSanto Niño image at the facade or at the main altar. That is because Santo Niño is the patron of the Augustinian congregations. The presentation of this image may be expressed in many ways. 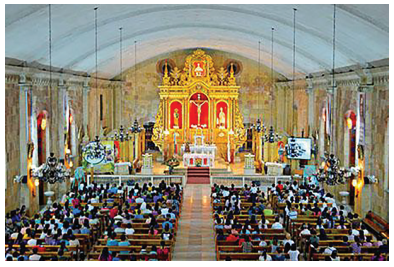 In the case of Miag-ao church, where is the image of Santo Niño? Monsignor: Have you seen the central figure of the church’s facade? It is the bas relief of St. Christopher carrying the child Jesus (Santo. Niño) on his shoulder. The sculpture in the pediment narrates the popular legend of St. Christopher who was tasked to carry people across the river where there was no bridge. Only to find out that one of them, an unusually heavy child was Jesus Christ. Monsignor, let’s talk about the belfries. What where the towers for? Monsignor: The towers were part of the architectural design of the Church. That was common during those times. For me, it stands for the authority of the Church. It could also be a watch post at the time of raids of Moros which was prevalent during those years. But, surely, it has to hold the belfries at the higher level so that the people can hear the bells. Those bells express the voice of God calling them to worship and also a medium for an emergency call. Why were the two belfries built unequal in height? Monsignor: No one really knows. I had done some research on this issue but no information was available in the archives. As far as I know, when the church was finished in 1797, the left tower was lower than the right. Monsignor, it is commonly believed that there is a tunnel in one of the belfries of the Church that connects down to either the Capilla in the cemetery or the other watch tower in Baybay. Is there really a subterranean structure down there? Monsignor: There was no truth to that. When I started the restoration of the Church, I actually ordered an excavation of the floor of the towers. And there was none. What I discovered at the bottom of the right tower when you’re facing the church was a baptismal holy water depository. This is a common structure found in churches, especially those with baptismal fonts. So, There is no tunnel? Monsignor: I want to make it clear; there is no tunnel in the Church. In fact I made it available for the public to see so as to stop speculation about the existence of the tunnel. There was even a legend about hidden treasures. There is none. I personally supervised the search for the ‘tunnel.’ What I found was a depository walled by tiles in quadrilateral form and about a meter and a half deep. ’I’m afraid that one day people will just start to excavate the church ground thinking and believing that there’s a hidden treasure. The church may collapse due to soil movement. That was why we have to end this speculation. Again, there is no tunnel. There is no hidden treasure. Monsignor, let us go to the renovation of the church. Give us the idea about it? Monsignor: During the entire existence of the church, it had been burned three times. Notably the church was burned during World War II. What remained standing were the walls, facade and belfries. The stone walls were then plastered with cement mortars. When the National Historical Institute spearheaded the reconstruction and rehabilitation work, the first thing they did was to peel off the cement plaster on the exterior wall surface. This was then followed by the installation of the roof. It must be noted that I insisted that the roofing was to be elevated 2 meters higher than its original roofing for ventilation purposes. The roof has very strong and solid trusses. After the roofing was completed, we started to work on the ceiling. Then after the ceiling, the cement on the interior wall was peeled off to reveal the natural yellow sandstones of which the walls were built.. The concept of the design of the exterior wall was taken from the details of the facade’s design. As you can see, the tassel and trimmings, the plaster was all consistent with the architectural design of the facade. That is what you call continuity of design. Monsignor: I discovered that the original flooring of the church was buried 23 inches deep. We therefore took out the soil and other materials to recover the original and correct floor level of the Church. Did you discover anything unusual? Monsignor: There were debris like burnt wood, broken jar, stone blocks and particularly two skeletons buried on each side of the entrance to the sanctuary. Who do you think were these people? Were there markers of their identity? Monsignor: Maybe they were prominent people at the time. No, there were no markers or any way to identify them. Maybe these two had important contributions to the Church. They may be the priests, cabezas or town captains from a long time ago. Why do I say this? Just like in Jaro Cathedral the “Capitan” of the village at the time of the construction of the Church was buried at the front of the left side of the altar of the cathedral. So what was the original flooring of the church? what is the finished flooring? Monsignor: After renovation, the flooring now is finished with 60 cm x 60 cm marble slabs shipped from Romblon and Bulacan. The pinkish marble came from the quarries of Bulacan while the ordinary grayish marble was from Romblon. You have to remember that before the work had started, the workers had to locate the original floor level of the church and they had to excavate about twenty-three inches. That was a lot of work, Monsignor? Monsignor: In fact, I personally supervised the work. The workers had to change the entire thing whenever I am not contented or impressed with the results. I had to be around to watch them working so that I can revise whatever needs to be modified. Good that all the workers were able to adjust and adapt to my work standards. Most of the works were done by the local craftsmen of Miagao. Monsignor, what else were renovated? Monsignor: Renovation, rehabilitation and reconstruction of Miagao did not only happen during my time. You have to take note that during the Japanese occupation, Miagao church was burned. When Liberation came, Msgr. Enojo led the efforts of reconstructing the church. That was a huge task for Msgr. Enojo and the people of Miagao to bring back the glorious structure of the church. Monsignor: As I was emphasizing to you even before our off-the-record interview that I fear that many works may be attributed to me which were not really mine. In all fairness, Msgr. Javillo also had a remarkable contribution to the rehabilitation and reconstruction of the Church. During his time, Msgr. Javillo put his attention on the massive restoration and reconstruction of the facade. Most of the rehabilitation work on the facade was done during the term of Msgr. Javillo. So, to be safe, it was not only me who had exerted efforts to restore, rehabilitate and reconstruct Miagao Church. 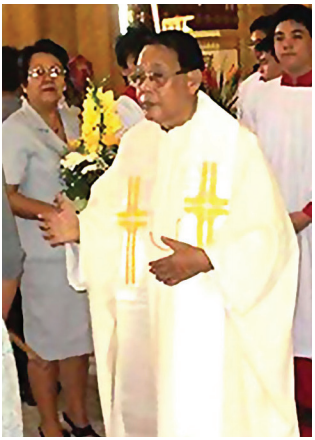 All priests, during their term in Miagao, had their own significant contribution to what Miagao Church looks like now. Monsignor: Yes, people of Miag-ao were very supportive and cooperative with me. I never had any sleepless nights when I started the renovations of the Church. The people were so generous. Imagine the fund we needed to sustain the project? It was millions of pesos, but I had no problem raising that huge amount because the people were kind-hearted. In fact, we organized a reconstruction committee to work specifically on the renovation and improvement of the interior of the Church. This committee was headed by Col. Solomon Flores. This committee had played an indispensable role in progress of the work during those times. Col. Flores was so unselfish both with his resources and time. The people of Miag-ao should thank Nong Solomon for this. Monsignor, how about the altar. How does the original design of the altar looked like? Monsignor: No documents were available to attest to the original design and structure of the altar. 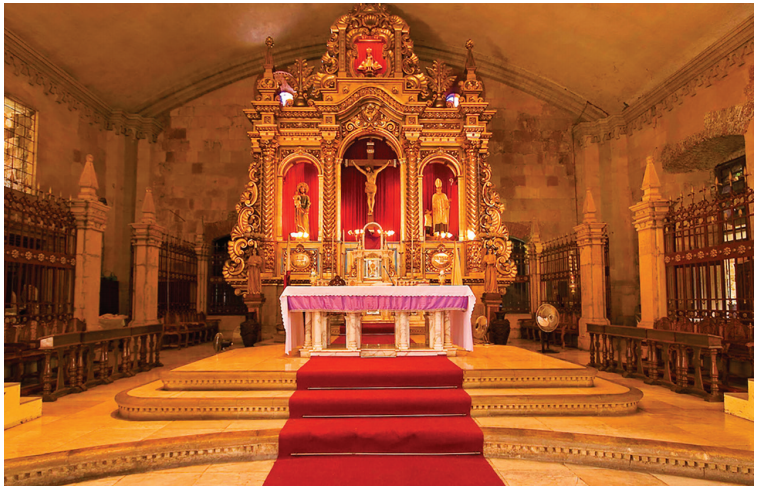 Before the work on the altar started, I researched in San Agustin Church Library in Manila but unfortunately no materials were available to speak of how the altar’s original design was. It was actually a challenge on my part to come up with the design of the altar since the next work after the walls and the floor was the altar. I commissioned a well-known group of architects from Manila to come up with the design of the altar. To make the long story short, they had started with the design and after a while they submitted to me their proposal. But, modesty aside, I was not convinced of the design. So, I decided to slow down with the work on the altar. There was no progress about this for a couple of months. My plan was to finish the altar in the year 2000 to dedicate our Church to the Lord’s 2000th birthday. But, you know, God was so good. While I was conducting a mass in Palaca, a vision on how the altar should look like appeared to me. I hurriedly went home to the convent and started drawing the idea that appeared to me. I know it was God’s work. Yes, I was able to come up with a concept of the design and was able to translate that into a drawing. I immediately called the architects in Manila to inform them of what happened. I gave them my drawing and they started to work on a technical design for the altar. And behold, when they submitted to me the final layout of the design, it was so perfect. The vision was perfectly translated into that piece of paper. about it. To make it short, I had signed a contract with the firm and the work on the altar had started. Any problems along the way? Monsignor: Nothing. The contract stipulated that I shall pay the firm in installment. I always paid them even earlier than the deadline. I never had any problem with the fund. Our people were so kind. I am so thankful of that. I never had any problem. So, the altar was finished on time? Monsignor: Yes and we dedicated that in year 2000 in honor of the Lord’s 2000th Birthday. What are the materials used for the altar? Monsignor, how about the walls? Monsignor: If you can remember, when the flooring was under construction I insisted that it had to be excavated to find the original floor level. What happened in the construction of the wall was that I ordered that the wall had to be added 2 meters on the top to enhance the ventilation. In effect, we elevated the roofing by 2 meters. After the cement plaster was peeled off on the exterior wall surface, the natural characteristics of the stone were revealed. The next challenge was what to do with the added two meters to the wall to elevate to roofing. What I did was I banded it with tassels and trimmings. This tassel design is very prominent at the belfry of the church. So that was what I did to be consistent with the design. So as you can see it now, that is the result of my imagination. So, Monsignor, what we can see right now is the original stone walls? Monsignor: Exactly. Those are original stones. These blocks of stones were quarried from the mountains of Igbaras and some were from Sitio Tubog in San Joaquin. So, you can imagine the labor of our forefathers to construct our church. This is something that we should value. This is something that we should take care of and always remember. How about the roofing, Monsignor? Monsignor: The roofing was primarily supervised by the National Historical Institute (NHI). They designed a new steel truss replacing the wooden trusses and roofing. These trusses are very strong. After the roofing was done, the work on the ceiling started. The form of the ceiling practically followed the trusses designed by the NHI. What are the other projects that involve the rehabilitationand renovation of the church? Monsignor: One of the notable projects is the construction of the choir loft. Originally, the choir loft is not part of the Church design. The construction of the choir loft is intended to reinforce the church. But, the design still is consistent with the design of the church, especially the columns and the piers. If there something a Miagaowanon can do to help the preservation of the church, what should it be? Monsignor: Miagaowanons should be proud of their Church. The preservation of this World Heritage structure is everybody’s responsibility. Let the next generation be as fortunate as you to still see this structure, a product of the labor of our ‘kalolohans’ (great grandfathers). But above all, we must dedicate this Church as the manifestation of our faith. This Church is nothing more than a structure but our faith is everything. The church is not the center of our faith, Jesus is. So Miagaowanons should take pride of this heritage while living the true essence of being a Christian.